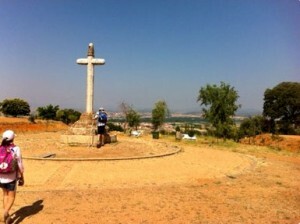 *Shane walked the Camino de Santiago from León to Santiago de Compostela with his family; a trip booked with CaminoWays.com. It is just before 6am. I am sitting in a hotel room in Sydney, Australia. Next to me my wife sleeps softly, my children are in the adjacent room sleeping soundly. I have been awake since about 4am because I am still suffering slight jet-lag as my body adjusts to our return from Europe yesterday. It is mid September 2013, we have been on the road for over 2 and a half months and we have about a week to go before we make it to our home in Hervey Bay, Queensland. 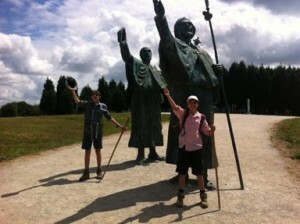 In July I travelled to Spain with my wife and kids, we went there to walk the Camino de Santiago, the Way of St James. We spent 3 weeks as pilgrims on the trail from Leon to Santiago de Compostela, a distance of just over 300km. Following that time we spent the next 8 weeks travelling by train across Europe visiting all the famous sites, doing a grand tour. And now we are home. Now I sit and reflect. Now the full weight of what we have just accomplished as a family begins to descend upon me and I am filled with a pleasant mix of pride and joy and relief and even a little sadness that it is all but over. And Spain calls me again. That ancient pilgrim route has worked its way deep into my psyche. That dusty pilgrim trail, the hot clear Spanish days, the warm still Iberian nights filled with food and wine and the melodic chatter of those beautiful people. In all that we have seen and done from Rome to Paris, from Avignon to Budapest, from Berlin to London that thin rural track cries out the loudest. It sings you along to its final destination, that magnificent granite edifice in Santiago, the apostle’s bones protected by a mighty fortress of faith. I can see, even now with my waking eyes that mighty botafumeiro, pendulous and deadly, curving its mighty arc across the nave. I can almost smell the sweet smoke that lingers and falls onto the heads of the pilgrims gathered below. There is great joy to be had in that holy place, great blessing to be received in union with the multitudes who have gone before. Its no small thing to hear the name of your home read out loud on a foreign shore, in a famous place, to know that you have accomplished something great, something significant in your life. The real joy in reflection though is not in the greatness of the deed but rather in the simple humility of the way. To have lived in each moment. To have taken just one more step, then another, then one more until finally … rest from the road, food for the soul and the sound sleep of the honest. I am 45 years old, my children are 10 and 13. The Camino de Santiago challenged us but did not break us. It was tough on each of us in its own way but it was good to each of us in many more ways. I cannot imagine a more profound and important thing to do as a family, to live in each moment together, husband and wife, parent and child. To walk through the rural countryside of a foreign land, to see people living simply, to smell the cows in the dairies and feel the heat rise up off the road. These basic things bring into sharp contrast the indulgent lives we live. It is good to know, particularly for young people to know, that even now there is a simple way. It is now just before 7am. Below me and around me the city stirs to life. In a little village in Spain pilgrims sit outside a little stone cafe even now, enjoying their evening meal feeling the weariness of the road being washed away with a glass of chilled red wine, talking with new friends met. It truly is a buen camino. Shane Altman is the principal at St James Lutheran College in Hervey Bay, Queensland, Australia. He wrote an inspiring blog about his family experience on the Camino de Santiago, called The Pilgrim Principal. Hi Leentie, you can find an overview of all the ‘ways’ to Santiago on our website:http://caminoways.com/destinations/camino-de-santiago.html. Your trip will depend on the amount of time you have also, many people do the last 100km from Sarria to Santiago over 1 week but if you have more time, you can walk more sections of the French Way (the most popular route). Let us know if we can help. I want to walk cumino in 2014,where do I start and what do I organize?